Well, today we have Elizabeth Nadler-Nir, a speech therapist from CT. She’s just won a prestigious prize in London for her online reading program for challenged readers. Elizabeth, it’s lovely speaking to you. I’m very excited about this. Nice to read good stories about SA. Can you tell us about this prize you’ve just won? Yes, Linda, thanks for interviewing me. It’s a team effort. Although I’m the face of the program and the inventor I have business partners, David Lewis and Natalia Pereira from Johannesburg and CT so, it’s a real, bit team effort. 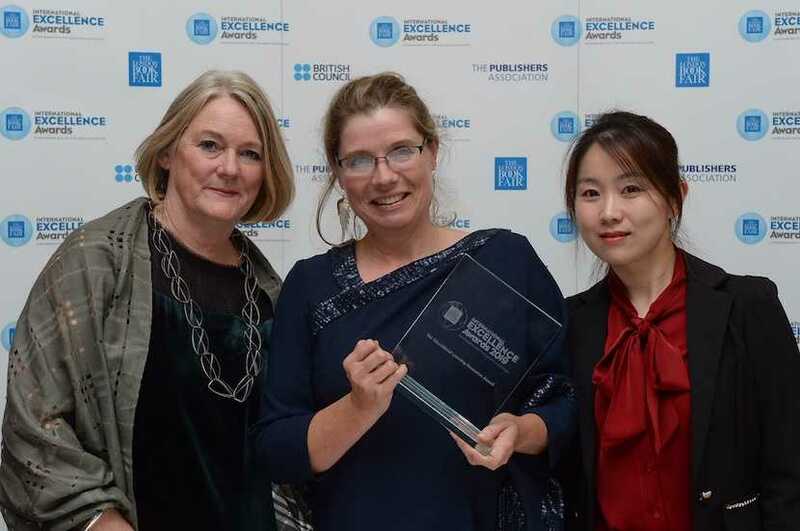 The London Book Fair International Excellence Awards and we won the prize for the Learning Resources Award and we came runner up for the Educational Initiatives Awards so, very exciting for us. Give us a bit of a background. How does your program help kids with learning difficulties? I have a long history of working with challenged readers. Those really bright kids who often end up being entrepreneur and do incredibly well but they struggled with reading. So, it was sort of my lifetime work, I worked with the genius programmer, Darryl Buckley, and we tried to do what I do in a reading session and looking at the delayed older reader. So, its for kids who’ve already fallen behind, so they can read a basic level 2 or grade 2 text. But they might be 13 or 14, or they might be 9, but they’ve fallen behind and we really work on reading accuracy, reading rate, vocab, and comprehension. So, it’s a very good solid remedial program for the delayed older reader. What is the extent of the level of literacy in SA or the problem that you’ve identified? It’s enormous. The PIRLS Report, which is an International Report on Literacy Levels have pegged SA as last. About 78% of our children can’t read for meaning by grade-4. Internationally, in the UK I suppose it’s 8 turning 9, in SA it’s more 10-year olds so that would be year 4. So, really when children should be reading for meaning. You know, the first 3 years of formal literacy instruction is to learn to read, and then from year-4 it’s reading to learn – it’s like a shift and our children in SA, the majority of them can’t read to learn and it’s a complicated issue for many reasons, but it is a crisis. So, this program was really developed for children who struggle with dyslexia, those really bright children who just even, despite intervention, can’t get enough practice. But what we found is that the need is so broad that we are now applying it further afield and because it’s online it’s accessible – I think that’s probably why they recognized us in the award. I’ve been wondering about the online side of it. Do you need speech therapist to guide you through it? Is it an app on the phone as well or an online program? No, it’s so not a speech therapist. I’m a speech language therapist and even people say, well why does a speech therapist teach reading? Well, I just specialised in that. But really, we designed it with best practice videos, like teaching videos in every section so, anybody who has got better reading is patient, and being prepared to be a reading partner for the delayed reader can use it. So, the online thing is so exciting. In some of the schools we’ve got parent volunteers coming in. In other schools, like in Forres School in CT, we’ve got older peers. So, you’ve got peer mediated reading. You’ve got 12-year olds reading with 9-year olds and they watch the videos, they get a bit of training and suddenly you get 10 kids with 10 older reading partners and then one specialist to watch them all so, it’s just scalable. How scalable is it in the townships because they might not have computers? Well, we’ve got about 100 so far, sponsored accounts from some extraordinary people in CT and we’re in two children’s homes in Johannesburg – we’ve got an initiative with Natalia Pereira is running in the library with volunteers and children are bussed in. We’ve got some school leavers, who are out of work and we’ve got them on VRG. We’re finding their reading levels need a bit of practice. They then go back to their schools so, we’re getting tablets donated. Phones are too small because literally we sit together, you snuggle in and you click on the errors. If it’s a touch screen you touch the errors that the child has made, and the program stores it and then they work on the errors. So, the screen can’t be too small. But really, we’ve got donated laptops. We’ve had to get in some extra cables donated because the plugs have been pinched – you know, whatever we can use. And in another school, we’ve got some tablets and they were working in the corridors because the computer room wasn’t available. Yes, so we really are just learning and as we go, we’re using whatever. We’re really having to think out of the box because wi-fi is now more available. Was there sort of a level of awareness in dyslexia in all communities, even the under-developed ones in SA? No, there’s not. When I come to the UK and it’s so ‘first world’ and there’s dyslexia actual groups and they use the term dyslexia. In SA it’s starting but it’s still so much in the privileged sector. I go into a township school into a grade-3 classroom with 9-year olds, this is a classroom that’s just been… We had about 50-thousand kids not placed in the beginning of the year in CT. So, there’s this little school that started up with 350 kids, and I sit there and the number of languages, and you know that 10% of kids are going to have a neurobiological problem with reading. Bright, normal kids – but they’re not wired for reading but in SA you can’t even separate those underlying dyslexia from a lack of teaching. So, we’ve got lots of work to do in SA and there are amazing institutions doing beautiful stuff. There’re programmes like Wordworks and The Shine Centre. They’re doing all the early stuff. We, with the virtual reading gym, are coming in for the older reader but we’re finding it’s across the board. You can get a grade-9 who can’t read and you clearly see that kids probably got dyslexia but never diagnosed. Well here, the most famous man with a stammer or a stutter was, in the UK, of course King George VI – what was he called? Bertie by his family. He was so brilliantly played by Colin Firth in the King’s Speech. Yes, and here they called him the ‘spare’ the number two in line to the throne. But then his brother Edward was lured away by divorcee, Wallace Simpson and he was thrust into the spotlight and had to speak in public with great difficulty, as you can see in the movie. Your program deals with that too? No, it’s not a speech therapy program. It deals with dyslexia. So, people who are normally bright but have problems acquiring this code of reading and becoming fluent in reading. The Richard Branson, Jamie Oliviers – they are incredible entrepreneurial thinkers. For me, the dyslexics are very often with people who are kind of out-of-the-box thinkers but they’re struggling with this code. They do end up as architects and engineers and a lot of the creative roles, and in business. That’s where I see a lot of very talented business people but they struggled when they were younger. Well, you’ve now won this prize in London. Do you think you’d be able to get more interest from overseas in your program? Ah, man, I’d love that. That would be just fascinating. So, we’re really out still with Brexit and stuff and terms and conditions and foreign currency and all of that. So, we’re still sort of working that out but once that’s done, we would love to help everywhere because it’s online and there’s videos there. As long as it’s for the right child so, it’s not for a kid who can’t read. There are lots of other beautiful programs for that. It’s for those kids who are struggling to become fluent and access the text. The UK is actually lagging behind the rest of the developed world in reading, and it’s often because of dyslexia. But as you’ve said, I’ve looked at my own kids, as soon as you reach what we call primary school you get tested and you would be helped along the way, and some of those kids eventually go to Oxford and Cambridge, wasn’t Einstein also dyslexic? Yes, these are the children we really have to save. Those bright kids who don’t get the correct instruction so, they think they’re stupid and they are so absolutely not. I’ve worked with some kids for 5 or 6 years and I know they’re going to be game-changers, I can see it, but my job is to save the academic’s self-esteem so they can believe in themselves because they are often very great thinkers. I see here also in the schooling system you don’t always have the resources to give those children the support they require. It’s actually an ethical right really but resources are limited everywhere. It’s amazing in London, it’s so diverse. The number of languages I’ve come across so, you’re seeing kids also learning in languages that are their mother tongue. We have that hugely in SA. Is your program only meant for English or can you use it for other languages as well? It’s an English reading program that was for challenged readers developed as an intervention but what we’re finding is that some second-language learners, who haven’t had enough exposure sit with a person who speaks fluently in English and reads with them and we build vocabulary, we build reading. Margret Lewis, our writer, has written really meaty, language, rich and interesting content that goes from about a level-2 reader, right up to a level-8 or grade-8, which is young adult reading. So, we’ve got a range of texts, language rich, and we’re having trans-language. A lot of people are sitting with the reading partner and just translating it up, looking it up – Google Images. It’s being used very creatively and I’m watching it with fascination actually, because I’m learning how to use it from other people. Amazing, well thank you so much for speaking to us. It’s always so nice when South Africans do something nice, that not only has a business component but it’s really helping people. I wish you every success here and overseas with your program.